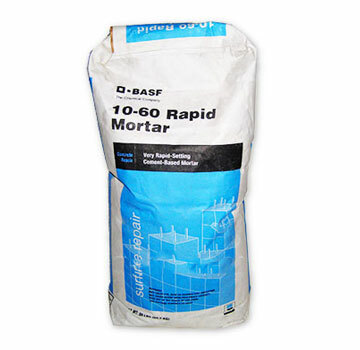 BASF MasterEmaco T 1060 Rapid Set Mortar (formerly 10-60 Rapid Mortar). A Rapid Set Mortar for Horizontal Concrete Surfaces. 8000 PSI Compressive Strength. BASF # 55404987. Yields ~.43 cuft/bag. 50-lb(22.7kg) Bag. Price/Bag. Shipping Leadtime: 0-2 business days. 10-60 Rapid Mortar (formerly called ThoRoc 10-60 and 10-60 Rapid Mortar) is a one-component shrinkage-compensated very rapid-setting cement-based high strength mortar. It is designed for repair of horizontal concrete surfaces where high early strength gain is required. Can be applied from 1/2 to 4" thickness, and thicker with extension by adding 3/4 aggregate (see Data Sheet). One bag yields about .43 Cubic Feet. Applications requiring high early-strength gain. Also available in 10-61, with extended working time.